The Copa de la Reina (Queens Cup) is a knock-out competition in Spain that plays the best eight teams in the first phase. A number of French players were on display during the tournament alongside players who have made a name for themselves in France. 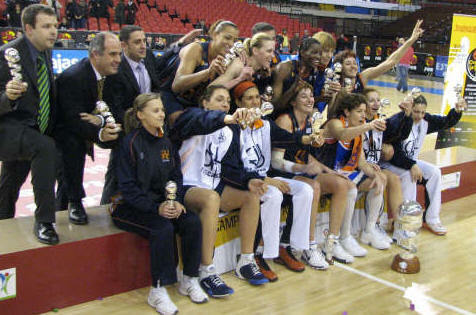 Allison Feaster (left) who made a name for herself in France with Aix-en-Provence and USVO was called up for French duty under Alain Jardel in 2005. Due to her pregnancy she was unable to answer the call. She is currently playing for Club Baloncesto San José and was in inspirational form during the tournament. In the quarter-final match against Extrugasa she scored 32 points including 7-of-12 from beyond the arc as San José held on to win (71-61).She was also on the score sheet in the semi-final match against Perfumeria Avenida. She scored 9 points in their (76-63) victory as San José qualified for the final for the first time in their history. The final was a classic affair that went right down to the wire with Ros Casares holding out (68-66). Feaster scored 11 points in the final. Nicole Antibes is back in Spain for Rivas Futura after a successful season in Italy. All her experience was not enough as Rivas were eliminated by Ros Casares in the quarter-final (73-42). Antibes scored 10 points and took 11 rebounds in the defeat. Leslie Ardon, (left in blue) who is a product of Bourges Basket’s youth development programme, spent four years in America at Seft Hall University between 1999-2003. On completing her studies she returned to France and Bourges. She did not stay for long in France as she left for Leon in Spain. Then she changed to for her current team Extrugasa at the start of last season (2006-2007). She scored 10 points for Extrugasa in their quarter-final defeat against Feaster’s San José (71-61). 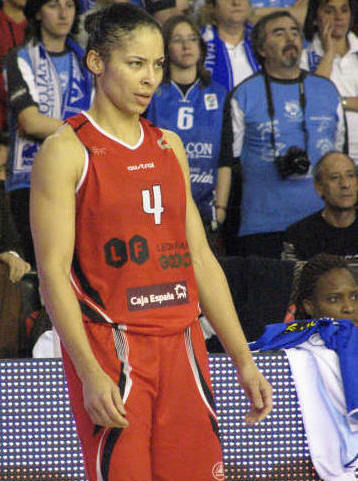 Cathy Joens was the top scorer in the LFB last season for Aix-en-Provence and led Rivas Futura scores with 14 points in their quarter-final defeat. Olga Podkovalnikova who left Lattes Montpellier in December also ended up on the losing side on the opening day as her team Olesa Espanyol fell to Perfumería Avenida (74-54). Podkovalnikova scored 13 points in the first half and finished the match with 17 points. 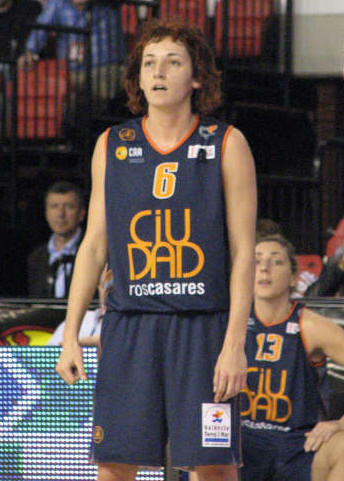 Belgium international Anke De Mondt who spent two seasons with Villeneuve D’Ascq contributed 9 points for Perfumeria Avenida. Laia Palau (left) who won everything in France was once again on a winning team as Ros Casares won the tournament. She was talking to Miguel Boudoy Cano from lokosxelbaloncestofemenino.com on the first day of the competition. She spoke about the importance of their opening day’s victory and the objectives for the rest of the competition. She also mentioned the victory against USVO in the EuroLeague Women and gave her thoughts in French on their opponents in the next round. You may listen to Laia Palau here. 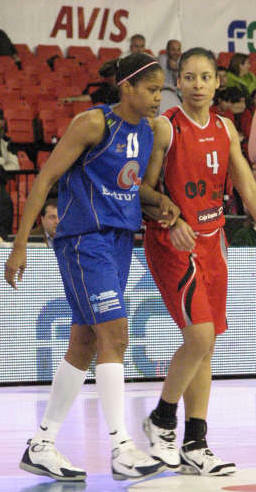 The other former player of Bourges on the winning roster is Greek International Evanthia Maltsi. Bourges Basket and Ros Casares will meet in the EuroLeague final four if they win their quarter-final series.